Jared Herle of the Wilkie Outlaws fights off a scoring attempt by Kyle Donaldson of the Kindersley Sr. Klippers in a game on Feb. 1 in Kindersley. The Sr. Klippers would go on to win 7-5, but Wilkie would beat the Biggar Nationals the next night to finish first in the standings. The battles for the Sask West Hockey League and Sask Valley Hockey League championships start this weekend with quarterfinal matchups ready to go. The Wilkie Outlaws and Kindersley Sr. Klippers have earned a bye to the league semifinals as the top seeds heading into the league’s quarterfinals. The final games of the regular season were played last weekend, and the only changes in the standings were at the very top. 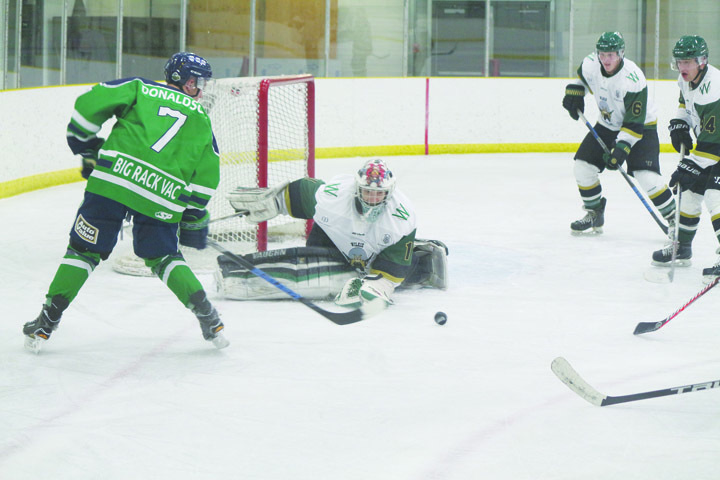 The Sr. Klippers ended a four-game losing streak by beating the Outlaws 7-5 on Feb. 1 in Kindersley.